It’s always fun to take a chance on unfamiliar wines. Sometimes you get burned and other times you find something fantastic. It was something from a bit of both sides in these two Blason wines we recently picked up for $7 a bottle at K&L wines. In California, wine for that price is of itself notable, but what drew us to these two wines is that they are from one of those wineries that, while officially Italian, is also sorta Slovenian as well. Blason is in the Friuli-Venezia Giulia region of Italy, right up at the border of Slovenia. They’re in Gradisca d’Isonzo, by Gorizia and just south of Goriška Brda in Slovenia which is home to Kabaj Morel whom we’ve tasted previously. It’s wonderful wine region and this was part of the reason we picked up these two bottles as we figured the worst case scenario is that they would just be drinkable if not quite good. 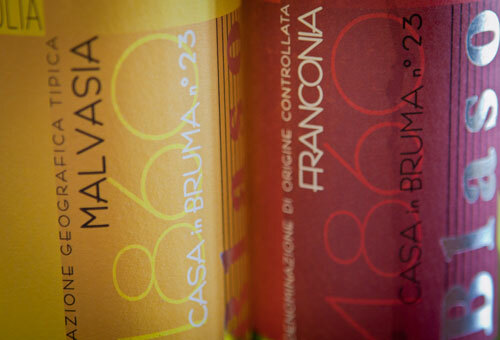 The Malvasia was definitely a pleasant surprise. Comprised of 100% Malvasia Istriana and at 13% alcohol, it presents a nice acidity and solid, light honeydew flavors with a minor touch of peach. It can pretty much be served with any lighter meal you would want to toss at it. Or, you can just enjoy it on a hot day as well by itself, although we recommend it to be had with food. As the name implies, the Franconia is comprised of 100% Blaufränkisch (to be proper) and has 12.5% alcohol. Blaufränkisch has always been a tricky grape for us. What we’ve tasted in Central Europe has ranged from decent to rather good. It’s never been an amazing grape, which might have to do with it being grown in areas that aren’t drenched in sunlight. When it comes to the variations of this wine that are imported in to the US, they are generally always the lower-priced bottles and as such, lackluster in taste and depth. Such is the case with this Franconia. There’s nothing bad about it once it breathes long enough, but the tobacco and strong earthy qualities that we assume are derived from the short 2-3 months it spends in Slavonian oak barrels are overpowering and not a lot of the grape comes through. The best part about it is the overall lightness. It can easily be had with foods and you get the feeling that even after polishing off an entire bottle, you wouldn’t really be all that drunk. Again, for the price, it’s certainly not bad.